Just a quick post but this annoyed the pants off me recently, and caused me to miss a meeting last month when I could not join a meeting being hosted using Junos Pulse Collaboration. I didn’t find much on the web when I searched, so I may as well generate that content! 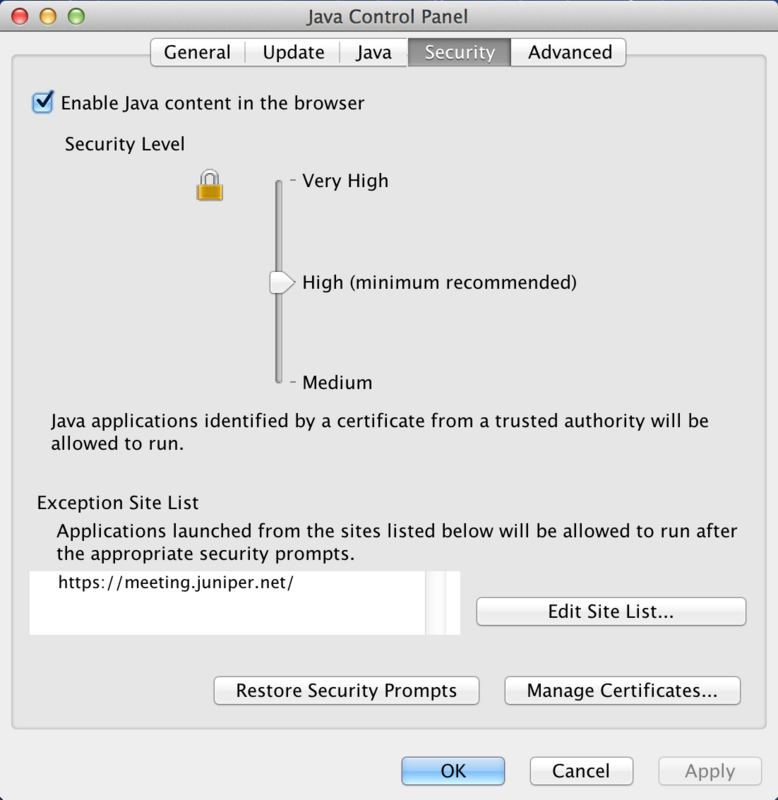 The first problem you may have, most recently, is to find that Java blocks the untrusted application by default. This will kill the client, so needs to be fixed even before the other problems get a chance to manifest. When you go to join the conference, try the “System Compatibility Checker”. If you have the most recent Java update (I am running version 7 update 51), you’ll find that the test application is blocked by Java. 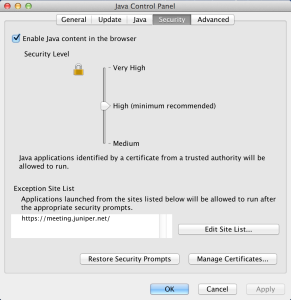 The Java control panel will open; go to the Security tab, and select Edit Site List. Now go back and try the compatibility tester again, and you should succeed and be told you can go join your meeting. Hooray! It would be nice if the compatibility tool had checked that too, don’t you think? I’m a good boy who logs in early to run compatibility checks, and I got bitten because despite being good to go, apparently, actually this isn’t supported, and no workaround is offered. So, you can’t run it in Safari. However, this does work, despite being a somewhat nasty-feeling workaround. So, you CAN run it in Safari. If you don’t mind doing that. Um yeah. You can’t really do that either because Chrome on OSX can’t run 64-bit Java, so when you try and run anything in Java it asks you to install Java, only when you install a version separately I gather it causes issues with the Apple-supplied Java. I don’t know. I just recall reading that this was not a happy place to be, so I avoid it. So, you can’t run it in Chrome. Firefox. Honestly I stopped running Firefox a while back, and never installed it when I got my Mac but given that Safari and Chrome are a bust, what else can I do? Firefox works with Apple’s Java, and doesn’t do whatever evil thing Safari does to break the Junos Pulse Collaboration client. You CAN run it in Firefox! So that’s it. 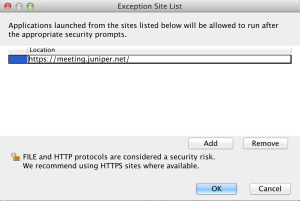 Fix the Java security settings, join your meeting via Firefox, grant permission for the Java app to be loaded, and you’re good to go. Hope this is of help! To make this work in Safari, the workaround is to allow the Java app to run in Unsafe mode. What does it mean that I don’t have to do the same thing in Firefox? Maybe somebody who understands the security models can answer better. An error occurred while extracting one of the Network Connect components. I’ve tried everything, but nothing works. Is there any way around this issue? Tried on Safari 7.0.2 and Firefox 27.0.1. Just wanted to say thank you for your assistance. This managed to get me up and running. Thanks for the assistance. This explained what I needed and helped me get going. 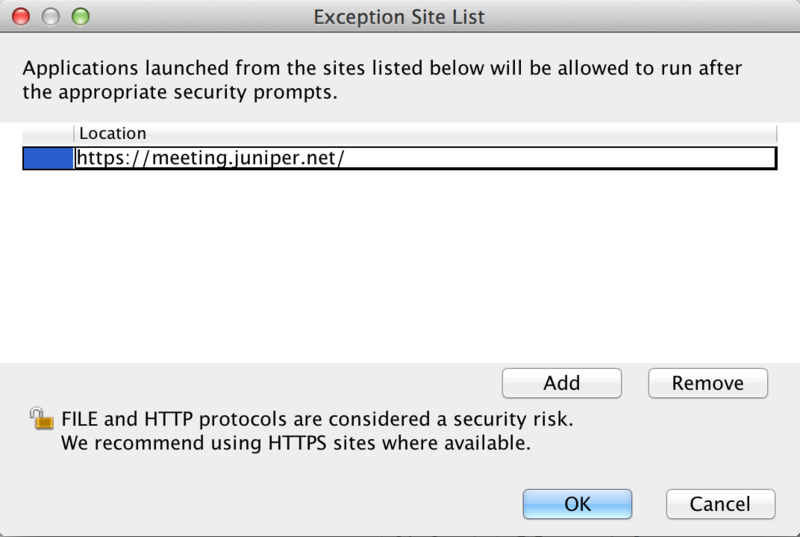 I was stuck because of the java option “run on unsafe mode” in Safari. Really great job, thanks very much! The workaround to allow the Java app to run in Unsafe mode works form me. But then, are there any security issues? uber helpful. this saved my bacon! thank you .. Thanks a ton; I used to pull out my office windows laptop from home to get into junks meetings – this tip has saved me soo much time since I can use my Mac to get work done! Was new to MAC and landed on the issue, your post did the job. You are brilliant. Same here, I just had to put my settings to run in unsafe mode! Thank you so much taking the time to post this, it got me unblocked and working.